Though the concept of working with reminders is not altogether new, I feel ‘Vinculum’ is one good tool that is not explained or used in our school or college mathematics, or even in our daily lives. Once we understand and start using it, I am sure we can do some very (apparently) tough calculations. It can also be used effectively in algebra as well. 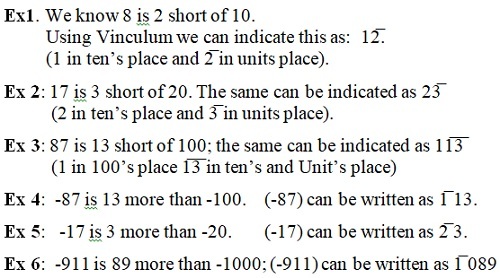 (b) Surplus over a given number over a negative number (which is also a Ten-multiple normally). The advantage of this notation is that you can avoid using brackets for negative quantities. Vinculum works like a minus (-) sign. (1thousand 1 hundred 42 short of 20 thousand). Using the same sutra to convert it back, we get 18858. In fact, Vinculum comes in very handy in subtractions. 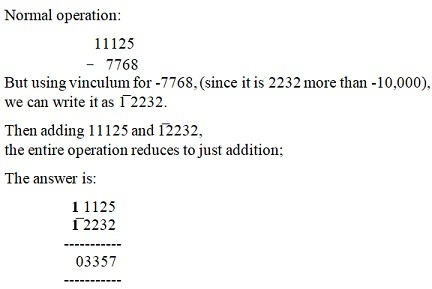 In fact, the whole operation of subtraction reduces to subtraction of only one number, and addition of the rest. How? This is equally applicable to division and makes division easy. However, it is advised not to venture into it now, until a fair level of command of using Vinculum for the other three operations is obtained. 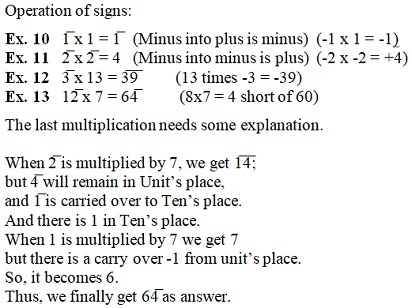 In the next article, we shall see how efficient vinculum operator is in finding out answers for large multiplications, finding squares, cubes etc.